We started out on this trip with brand new backpacks (read our review of Osprey Waypoint here), all tidy and clean with freshly washed clothes packed in perfect order. But needless to say, it didn’t stay that way for very long. Soon some of the clothes became dirty and wet, and we didn’t have time to pack everything properly each time we moved on to a new place. So after a couple of months of increasing backpack chaos and one experience with bed bugs in a hotel room we stayed in, where we had to freeze and wash EVERYTHING in our backpacks on 60 degrees, we had to find a solution. And the solution turned out to be Eagle Creek Packing Cubes! We bought the cubes in Bangkok at the Smart Travel/ North Face shop at Siam Discovery shopping mall (3rd floor), after doing some internet research on the best packing cubes system out there. The Smart Travel shop at Siam Discovery in Bangkok, 3rd floor, where we bought our Eagle Creek packing cubes. 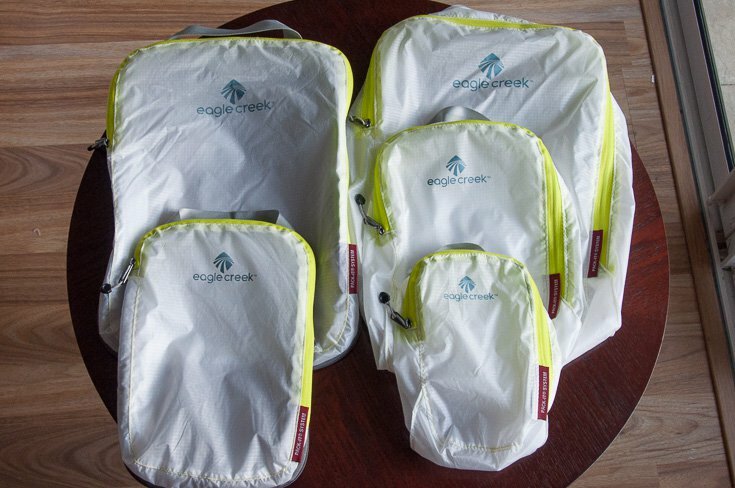 Eagle Creek have many different types of packing cubes, from colored ones to plastic see-through ones, both big and small, as well as compression cubes. They also have padded laptop/ tablet covers, but we haven’t tried them yet. 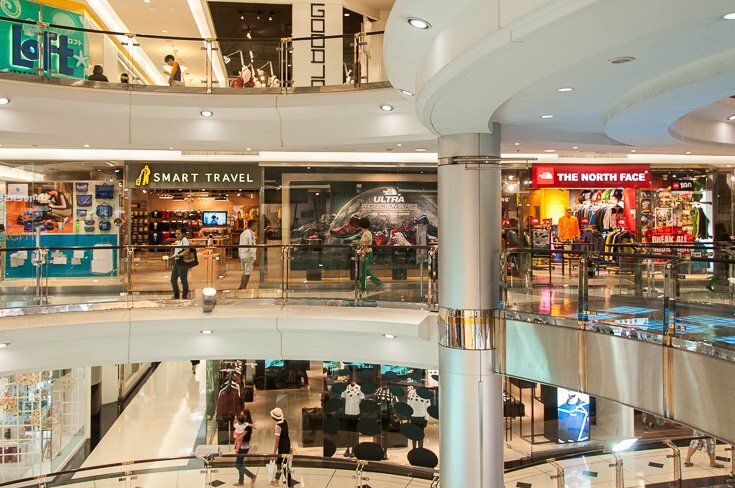 The Smart Travel shop at Siam Discovery is Bangkok`s reseller of Eagle Creek. What Kind Of Packing Cubes Did We Choose? One Pack-It Specter Cube Set (consisting of 1 big cube, 1 half cube and 1 tiny cube). Espen`s packing cubes: 1 Compression Cube Set and 1 Specter Cube Set. Two Pack-It Compression Cube Set (2 big cubes and 2 half cubes). Maria`s packing cubes: 2 Compression Cube Sets. How Do We Use The Cubes? Espen uses one big cube for his bottoms (shorts and pants), one big cube for his beach stuff (surfing shorts, surfing shirt, towel and sarong), one-half cube for his jacket, t-shirts and shirts and one-half cube for his boxers and socks. The last tiny cube is used by Indiana Jones, for his stuff as his hat, whip, guns, and shoes. I like the compression cubes in particular because they can be compressed into a smaller version by the extra zipper that goes around the whole cube. Very convenient! 🙂 That said, this is only possible if the cube is not complete packed to it`s maximum. Two of Maria`s cubes when packed with clothes. The one to the right has been compressed. 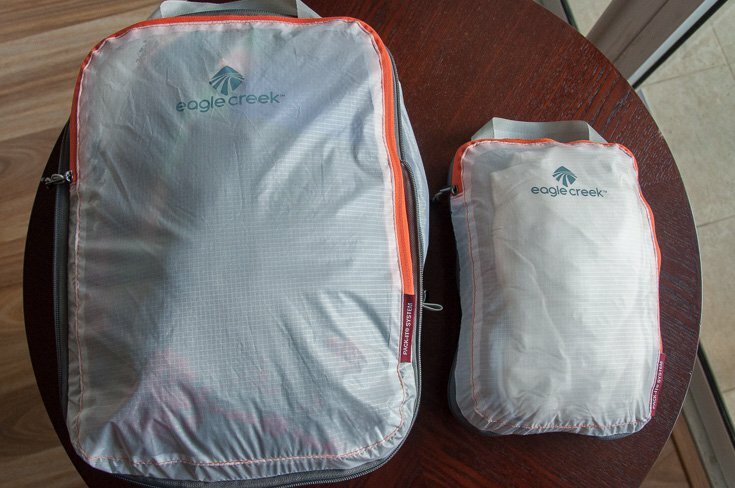 Why We Think Eagle Creek Make The Best Packing Cubes ? They are so thin and light! They hardly take up any space in the luggage and don’t add any weight. That was really important for us and the main reason why we choose this packing system. They are made of super-thin nylon, the same fabric as light-weight tents, and is durable, stain- and water-resistant! 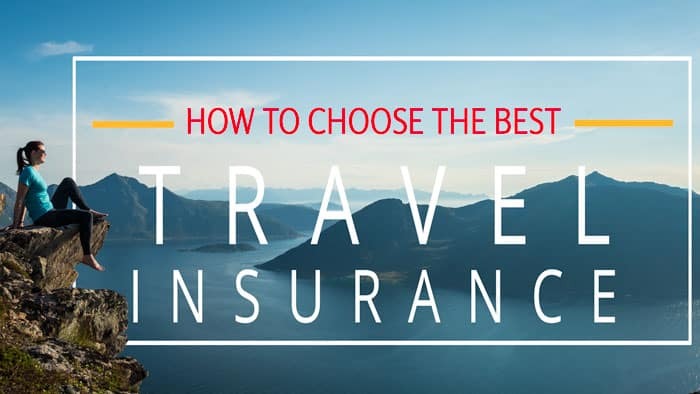 Which is great considering that the backpack can get wet or something can get spilled during flights. That way not everything in the backpack becomes wet and full of stains if something like that happens. They have a good zipper almost all the way around, making them impossible to get into by cockroaches, bedbugs or other creepy bugs. If we had these when we had the bedbug attack, it would have saved us so much work and washing (I also had to throw away some clothes that didn’t survive being washed at high temperature). I really hate bugs, so now I feel a little bit more at ease opening up my backpack at a new place. Maria`s backpack packed using the Eagle Creek`s cube system. 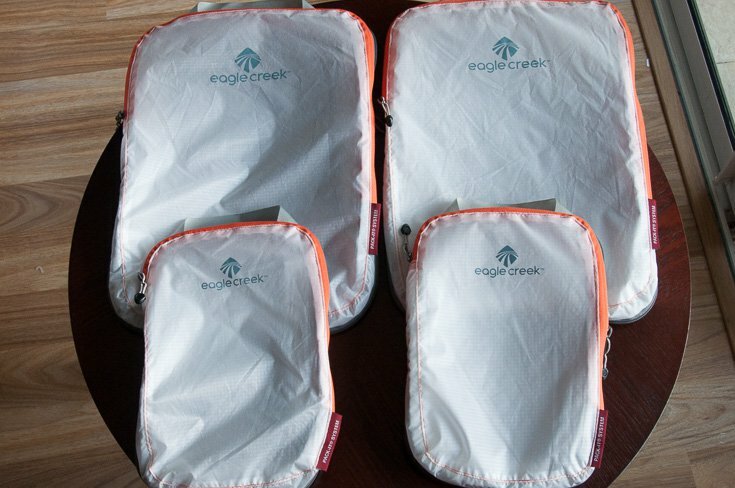 I really love these packing cubes from Eagle Creek! They make my traveling so much easier! Now it is quick and easy to find what I want to wear. They also make packing much quicker as each thing has its place. We use the cubes in our Osprey Waypoint 85L backpacks. If you are looking for a great travellers backpack, read our review of the Osprey Waypoint backpack here! 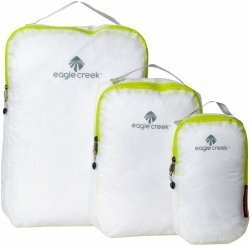 Where To Buy The Eagle Creek Packing Cubes And How Much Do They Cost? 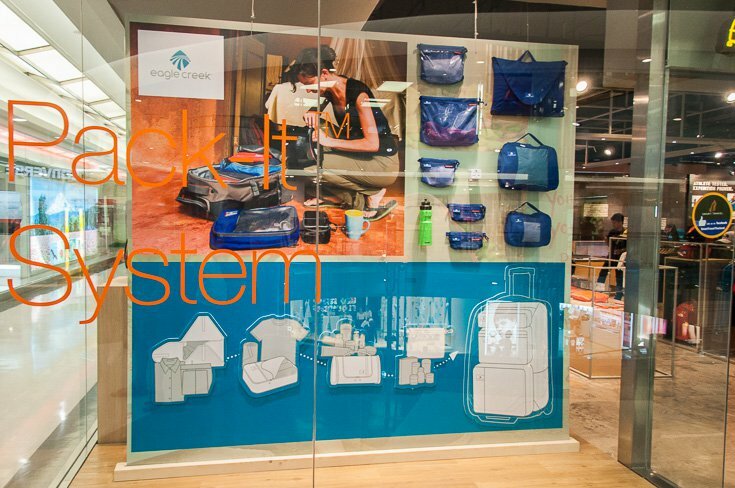 We bought our cubes at the Smart Travel/ North Face shop at Siam Discovery shopping mall (3rd floor) in Bangkok. We paid 1450 Thai Baht (45 us$) per cube set. It is a bit more pricey than at Amazon, which sells them for 38 us$. All of the above links are affiliate links, and we will earn a percentage of the sale if you purchase through them at absolutely no extra cost to you! This helps keep our site running at no extra cost to you — so thanks! 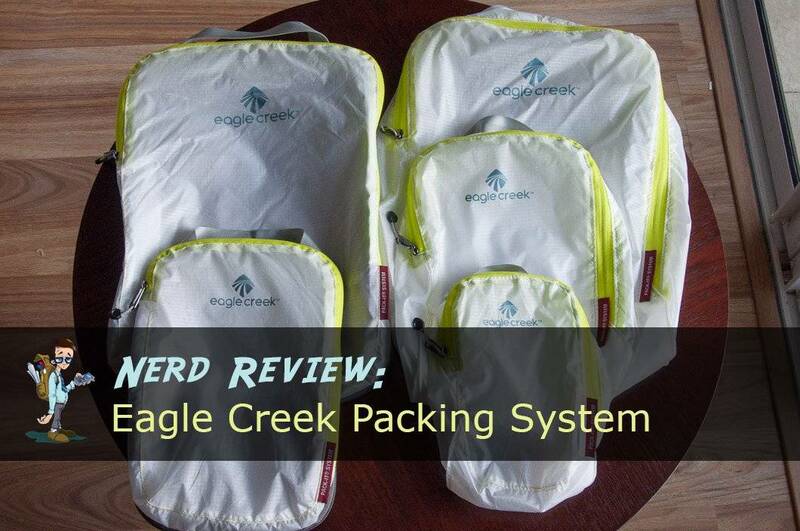 We did pay for the Eagle Creek packing cubes ourselves, so this is not a sponsored review! Just our honest opinions. Thanks for taking time out of your trip to share this advice. Definitely will use these on my next trip. Thanks for the excellent review. Great tips and I appreciate you telling us how you used them and what you put in the cubes. I’ll have to look into the Eagle Creek Cube System. The Eagle Creek ones are almost too small for me, hehe. I have packed them to their maximum, so they are impossible to compress :(. I have a serious over-packing problem going on! 🙂 I actually plan to send home half my stuff once we get to Bali, as my backpack is too heavy and big for island hopping in Indonesia. Well, we all have our “problems” I guess :). You should write a packinglist post on how you manage to pack so little, so that I can learn from you. 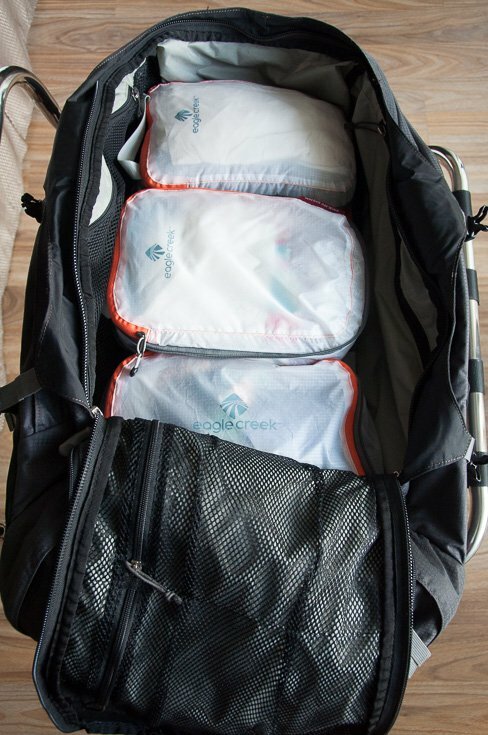 Totally agree with you, packing cubes are the best and a must-have when traveling! Ohhh I need me some of these, we are such bad packers. Its about time I took charge and changed that. Do you remember how much you paid for the compression set? Love shopping in Bangkok but imported travel gear can be so pricey there. Once saw some things that costed more than 4 times the Swedish prices. I just checked my online credit card record and see that I paid 1450 Thai Baht for the compression cube set (2 cubes). This is approximately 45 us$, So they are a bit more pricey in Bangkok than online at Amazon (38 us$). So you should definitely buy it from Amazon if that is doable for you. We did not have an address to ship them to, so had to buy them at a shop. Thanks for your quick reply! It’s the same for me, travelling around Asia so no fixed address. But 8 USD more is not that bad… Trying to look for them in KL but no luck yet. Trevlig resa! Ah, du er fra Sverige Jess, så kult! 🙂 Ser at Eagle Creek har en Store Locator: http://shop.eaglecreek.com/store/storelocator.aspx. Er du på lang reise rundt i Asia? Hvilket land skal du til nå, eller skal du være i Malaysia? Har varit i Aisen i drygt två år, jobbat på olika ställen och rest lite. Ska till Thailand sen för att fira jul med familj, hinner kanske kolla in compression cubes om jag har tur. . 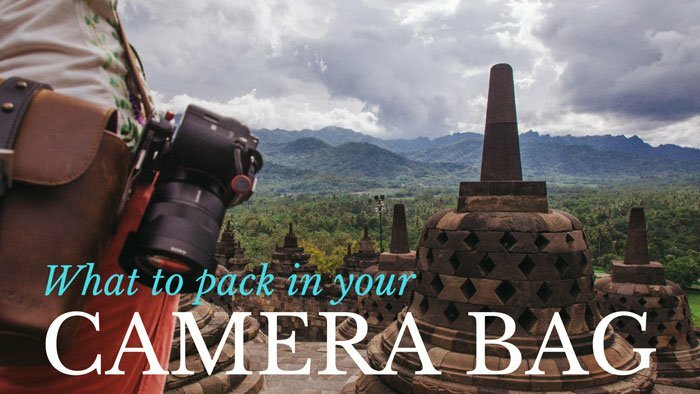 I agree, can`t travel without packing cubes, they are a must! 🙂 Thanks for the tip about two compartments cubes. We are totally in love with the cubes from Eagle Creek, as they are so thin and light weighted, and don`t take up any extra room in our bags. I have a dedicated cube for dirty clothes, so they are separated from the clean ones. How funny, we bought our cubes in the same store! haha. So happy I bought them! I did by the different one because I had the feeling the ones you bought weren’t strong enough but now that I see they are waterproof that would have been so much better! haha. We have now used our cubes for over a year, packing them to their limits, and they are still in excellent shape. I am a bit surprised too how solid and strong they are. Love these packing cubes and can never travel without them! You should definitely try them out. You can also buy them online, link is in this post. Have a great trip to Thailand!! Hi Maria! I’ve never thought of getting packing cubes – always just used ziplock bags. However I’m heading to Thailand for 10 days from the US (first time to that part of the world), and if cubes make it so much easier to pack than even ziplock bags, I may have to try them! Thanks for all the good info! Packing cubes have really saved me when it comes to packing and organization of my clothes and stuff. I really recommend them! 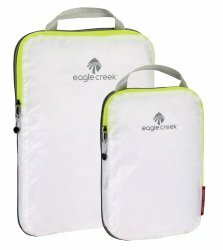 There are several versions and brands on the market, but I like the ones from Eagle Creek in particular as they are very light weighted and thin so they take up very little space in themselves. So cool that you are going to Thailand! Yay! You will love it, it is such a beautiful country! Thanks for sharing. 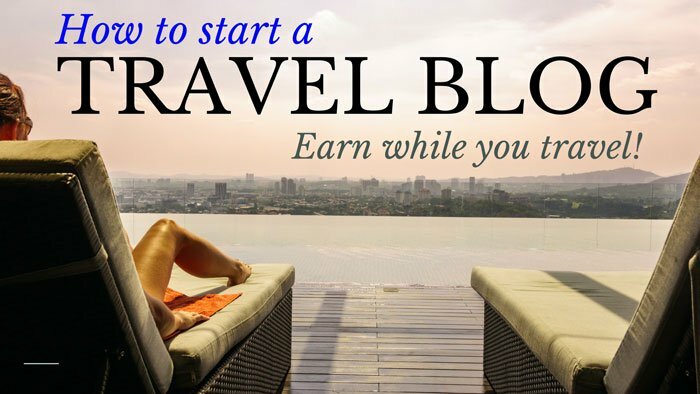 This is definitely something I will consider for my next trip! Packing cubes sure save you a bunch of time and unnecessary stress.